We are an Authorized Apple® repair specialist in the Tri-state-area now located in both, New Jersey and New York City. We are a small but skilled business with over 25 years of experience in providing Apple® services. We are committed to providing quick and efficient service to our customers. We service all Apple® products, including vintage and obsolete products. We also offer custom IT solutions for individuals and businesses, and expert one-on-one and group tutoring sessions. We are so grateful to be a part of this community and help resolve technical issues and inspire digital literacy. 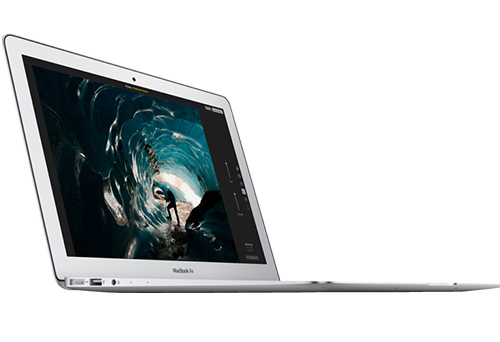 We sell the latest Apple® products, including but not limited to Macbook, iPhone, iPads, iPods, and Apple® watch. At iStore, we understand and respect everyone’s right to privacy.It is our company-wide policy that any data on a device left with us to get serviced will not be examined for the contents, and will never be shared with any other party, including Apple® Inc.*. Data recovery situations are no different. However, due to the nature of data recovery, a file name and file type list may be generated. This information will never be reviewed by staff other than to verify and determine a success level of the recovery attempt. Again, this data is never shared with any other party, including Apple® Inc. Does your device need repair? Does your data need to be recovered? How about a tune-up or an upgrade? We service all Apple® devices. Do you need help getting to know your new device and want to get the most out of it? Maybe you could use a hand with day-to-day tasks, or long-standing issues you’ve been tackling. For questions, troubles, and training of any degree, we offer tutoring sessions for both individuals and groups. Do you need to recover your pictures, videos, and memories from your iPhone, iPad, or computer? Our team can get the job done quickly, effectively, and professionally. 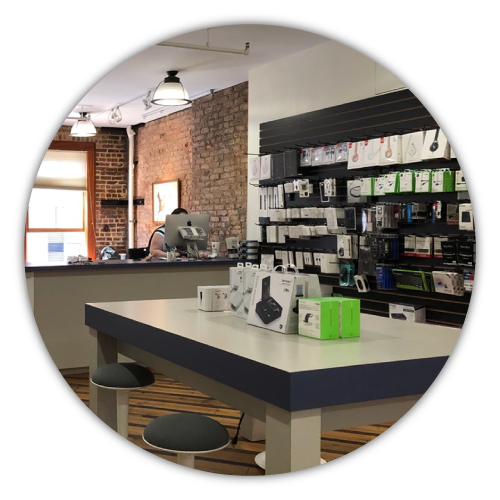 An Apple® Premium Resell & Apple® Authorized Service Center, iStore is your go-to for the full range of Apple® products and accessories. 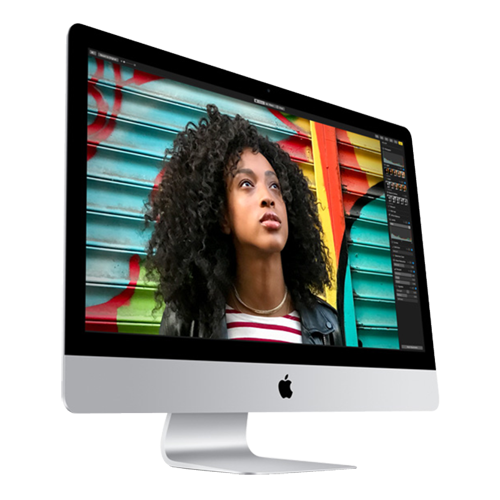 We are a fully equipped with a team of expert technicians with excellent product and software knowledge who can resolve almost any Apple® device issue, ranging from iPhone & iPad repairs, water damage to even reviving dead Macs. We at iStore strive to transform the customer service experience for both new and existing Apple® customers. We are committed to providing quality repairs, hands-on demonstrations and expert advice. 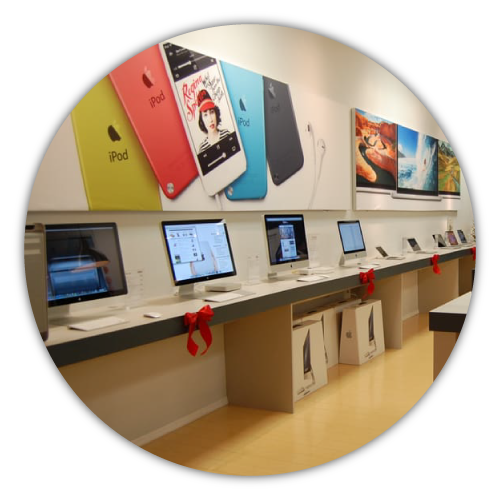 iStore employees are Apple® trained and certified to provide specialist advice. Whether you need a computer for your own family, at home, or at work, you are guaranteed help and advice to make the right choice. We use genuine Apple® parts to deliver Apple®-certified repairs, which are backed by Apple®. Discover the wide line of Apple® products and accessories in our stores located in New York and New Jersey. We know that you need your devices back immediately and that is why we offer rush service on almost all of our repairs. Get in contact with our Professional Services team to assist you. Not only was I treated kindly and have a problem with my phone charged port cleaned out and done at no charge but the person before me was also treated very kindly and respectfully. Bringing my Mac mini into this store for repair was the best decision I made. The gentleman in front was able to take care of everything with my device, very happy with his service. The Istore at st Moritz fixed my 2011 MacBook Pro. They got it up and running fine with new battery, new charger and cord for a reasonable price and in a timely manner. Quality customer service, 0 wait time, I will definitely come back again! They were super nice and knew what was the problem right away. They teach you how to treat your files and laptop really well. I recommend 100%!!!!!! I was concerned by the poor reviews of this place but that was not my experience. The back of my iPhone 8 glass cracked and I went in to get it repaired. I was told that it is not covered under the $29 AC+ screen repair program because it is not the screen glass and there is no way to repair the back glass. I accepted that (ultimately correct) answer and they promptly replaced my phone for the $99 AC+ fee including making sure it was up to the latest iOS and moving the SIM over. All in all a painless process. Would do business again.